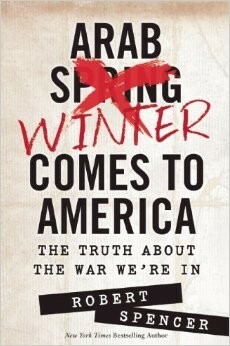 "America is at war; and has been since at least September 11, 2001, but no one is really sure who with," Robert Spencer writes in his recently released Arab Winter Comes to America: The Truth about the War We're In. Thankfully, Spencer's important book makes a significant contribution in clarifying this catastrophic confusion. That "Islam is a fundamentally peaceful religion" no different from…other faiths" in multicultural ecumenism, Spencer observes, forms a Western policy "cornerstone" and "cherished dogma of today's political correct elites." Yet President George W. Bush's claim before Congress on Sept. 20, 2001, that al-Qaida terrorists "practice a fringe form of Islamic extremism" does not "become any truer for being oft repeated." "[U]unlike other modern faiths, Islam is a political religion" whose "comprehensiveness is often a matter for boasting among Islamic apologists" in comparison to "Christianity's vague set of moral precepts," Spencer writes. Such detail includes a "denial of basic rights…integral" to Islamic law despite attempted Muslim portrayals of sharia as "so amorphous as to defy characterization." Islam's death penalty for apostasy, for example, gives it something in common with cults, making leaving in one piece difficult. Sharia interpretations "more compatible with Western pluralism and liberal democracy…have never gained any significant traction among Muslims." However undesirable, centuries-old Islamic orthodoxy invariably and unsurprisingly has controlling legal authority. "Jihad" in particular, "behind all the obfuscation and denial, is in fact primarily an Islamic doctrine of warfare," drawn from the Qur'an's "open-ended license to wage war against and plunder non-Muslims." Despite various references to righteousness (e. g. Sura 5:8), the "Qur'an doesn't teach that all are equal in dignity." Rather, Islamic conversion can mean rejecting "nation and people as infidel" in favor of a "new loyalty instead to the supranational Islamic umma." Spencer offers plenty of examples, including Fort Hood terrorist Major Nidal Hasan had a "broad tradition within Islamic teaching" justifying his killings with "numerous proponents." Although "not the only understanding of Islam…even the larger number of Muslims who do not adhere to it have failed to work in any effective way to rein it in." Accordingly, "Al Qaeda and other groups like it make recruits among peaceful Muslims" as "exponents of true and authentic Islam." Unfortunately, faith fundamentals in Islam do not necessarily favor freedom over sectarian force. Indeed, Muslim groups have no programs demonstrating "how the true Islam eschews violence against and hatred of unbelievers," Spencer criticizes. Similarly, "over twelve years" after 9/11, no "sincere and effective effort within mosques to expose and report those who hold to the beliefs that led to those attacks" has developed. Groups like the Hamas-linked Council on American-Islamic Relations (CAIR) "are ready with the condemnations after arrests and explosions, but why wait passively?" Muslim communities must "demonstrate (not just enunciate) their opposition to jihad terror Islamic supremacism," Spencer demands. Any silent Muslim majority in an oft-proclaimed "religion of peace" must preemptively speak out, both for its own credibility's sake and for the wider community's security. A "Jihad against Talking about Jihad" by Muslim groups and others, meanwhile, brands as an "irrational hatred of Muslims and Islam" any "resistance to jihad" in attempts at "demoralization and marginalization." Objective discussion of Islam's less savory aspects has become the "third rail of American public discourse." Here "tuxedoed barbarians" like the writer Reza Aslan, an Islamic Republic of Iran apologist, play a role, along with leading officials like President Barack Obama, who pledged in his June 4, 2009, Cairo address "to fight against negative stereotypes of Islam." Obama "didn't explain where in the Constitution he had found this awesome new responsibility," Spencer says. Not "changing…one iota," Spencer himself went from being a government trainer in 2010 to government banning in 2013. The United Kingdom prohibited Spencer's entry in June 2013 even as a Saudi sheikh who called violent jihad an "honor for the believer" entered. Earlier, in February 2013, Worcester, Mass. Catholic Bishop Robert McManus canceled Spencer's appearance at a Massachusetts Catholic men's conference before McManus underwent arrest for a drunken driving accident. "Apparently he smashes up cars, as well as reputations," Spencer writes, "with a Daisy Buchanan-like confidence that someone else will clean up the mess." No "fringe position of cowardice and appeasement," though, characterized McManus' "mainstream" behavior. Amid jihadist assaults, the "politically correct establishment blames America itself, and even conservatives are not at all united." U.S. Sen. John McCain's defense of Huma Abedin, an aide to Secretary of State Hillary Clinton with close familial ties to the Islamic supremacist Muslim Brotherhood, "was reminiscent of the moral preening" by liberals in support of convicted Soviet spy Alger Hiss. Significantly, American officials "misunderstand the problem they are facing and thus choose the wrong remedies to deal with it." These "officials refuse to speak about 'Islam' and 'terrorism' in the same sentence" using "quite a lot of verbal and mental gymnastics when jihad terrorists start quoting Qur'an and other Islamic sources." The Defense Department's Fort Hood shooting report, for example, "doesn't mention Islam even once." Although "perfectly justified in sending informants into mosques and scrutinizing devout Muslims more closely than, say, Methodist grandmothers," officials have thereby brought repeated lawsuits. Pursuing the mafia in Italian neighborhoods is apparently acceptable, but not Muslim terrorists in mosques. By contrast, an April 2013 army briefing grouped the Muslim Brotherhood with "Evangelical Christianity" and "Ultra-orthodox" Judaism in a "politically correct trifecta of the three main monotheistic religions." Despite such negative affirmative action, religious criminals, like perpetrators from various ethnic backgrounds, do not break down into politically correct, proportional quotas. Contrary to widespread Muslim violence, "Christians committing violence and quoting the New Testament to justify it exist today largely just in Hollywood movies." Analogies with the "ideologically biased junk science" of "Lysenkoism" in Josef Stalin's Soviet Union come to Spencer's mind, while the "real scientists who told the truth" went "to the Gulag." Efforts against a "largely non-existent 'Islamophobia'" (e. g. only 8 percent of religious hate crimes reported by the FBI in 2009 were against Muslims, 75 percent against Jews) receive foreign support from the Organization of Islamic Cooperation (OIC). The Obama administration joined with the OIC's 57 majority-Muslim states (including "Palestine") represented by Egypt in October 2009 to support a United Nations Human Rights Council resolution condemning religious "hatred" and "incitement." Yet these words "are in the eye of the beholder—or, more precisely, in the eye of those empowered to make such determinations" in an "Orwellian world," worries Spencer. The "foremost obstacle" in confronting "Islamic supremacism," Spencer concludes, is an "entrenched culture of self-hatred that denigrates anything and everything American and exalts the most inveterate America-haters as heroic underdogs." Indeed, American failures in combatting jihadist agendas described by Spencer arise not from any superior Muslim might, but from failures of nerve. Islamic supremacists have fooled many Americans that they face not foreign, faith-based sectarian threats, but rather invocations of American equality principles for an oppressed Muslim minority. Yet a religious ideology can be no less dangerous than a secular ideology such as Communism. Those interested in avoiding dangers of varying plausibility presented in Spencer's final "hysterical nightmare scenario" of an "America that is thoroughly cowed and subdued" would do well to read his book. I am sending you because I found out some wrong and misinterpreted information in your website. As islam - means in arabic "surrender, purity and Peace" and this makes me question how can something asks for peace and violence at the same time? So the logical question which I thought of when I read your words, Can a religion be contradicting? Actually, for me, whatever is claimed now as jihad is just manipulation on the ignorance of the people under the name of religion. Just a use of religion as a tool to justify political benefits. Another example of unclear evidence, that you think that there was a lot of fighting "terrorism"During the prophet Muhammad (Peace be upon him) and that it was how Islam was spread. in fact through trading. And up till now the number of Muslims from these countries exceed Arab Muslims. So how do you claim otherwise? I would like you to give me one incident of what you calim as otherwise. I know that from your Christian background, you are required to follow Luke 6:29 If someone slaps you on one cheek, turn to them the other also. If someone takes your coat, do not withhold your shirt from them. With the same exact way of thinking, I would like to ask you to open your mind and heart and think about JIHAD.